Turkish President Recep Tayyip Erdogan’s assertion that a 14-year-old Islamic State suicide bomber detonated explosives at a wedding in southern Turkey, killing 54 people including 31 children, is currently in question. What is not in question is that ISIS’ use of children as suicide bombers is surging. The day following the wedding bombing, a 13-year-old ISIS suicide bomber was captured in Kirkuk before he could kill. As appalling as this reality is, we shouldn’t be surprised by this horrific abuse of children. In its second intifada, Palestinians used child suicide bombers to murder Israeli civilians. During 2000-03, 29 suicide bombings were carried out by Palestinian children under the age of 18, and more than 40 other children were involved in thwarted attacks. Just like the Palestinians, ISIS uses children as tools of jihad. It maintains an army of child soldiers, called “cubs of the caliphate,” indoctrinating them with the group’s version of Islam and forcing them to participate in beheadings, crucifixions and other vile acts. ISIS has released footage showing youngsters practicing decapitation on teddy bears. These mock execution games prepare them to star in videos where children behead prisoners. ISIS is sending more children into battle as suicide bombers than ever before. 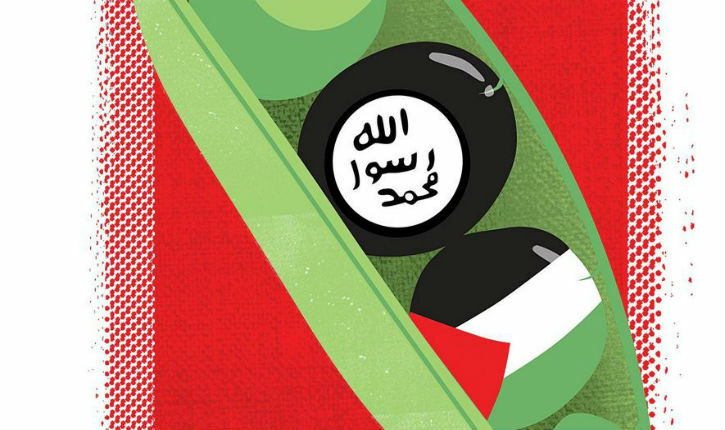 Although the Palestinians are not currently using the tactic of child suicide bombings, they vigorously pursue a campaign to capture the hearts and minds of Palestinian children. 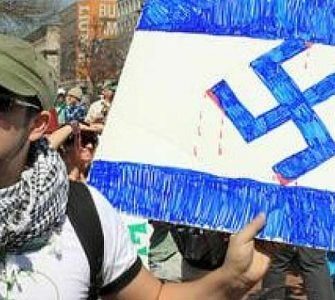 Poisonous incitement to hate and kill Jews and achieve “martyrdom” comes from all directions — Palestinian state-run television, radio and print media, summer camps, school textbooks and religious pronouncements. Music videos extol the virtues of killing Israelis. 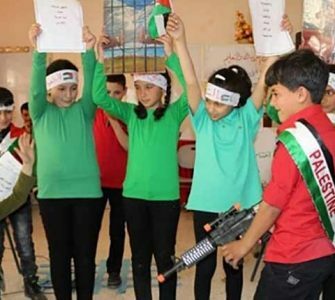 Preschoolers are brainwashed by cartoons, puppet shows and Mickey Mouse-like characters, indoctrinating them to see Jews as evil-incarnate “infidels.” Palestinian and United Nations Relief and Works Agency schools display posters of martyrs on their walls, use textbooks that deny Israel’s right to exist, and objectify Jews and Christians as subhuman creatures — a message that’s reinforced by imams’ vituperative sermons in Palestinian mosques. Every attempt is made to indoctrinate youngsters into the Palestinian “cult of martyrdom” (Shahada), which mandates that all Muslims, as a religious duty, aspire to die for Islam in combat against “infidels.” “Martyrs” become role models. Schools, summer camps and soccer teams are named after these terror “heroes.” Hamas’ Facebook page captured the message: “We bring [our children] up on love of Jihad and Martyrdom-death.” Women are taught, “Every mother should sacrifice her child for Palestine.” Martyrdom is the ultimate virtue — Jews are the ultimate evil. For children indoctrinated into this barbaric culture of hatred and death, killing Jews for Islam is like eating ice cream. 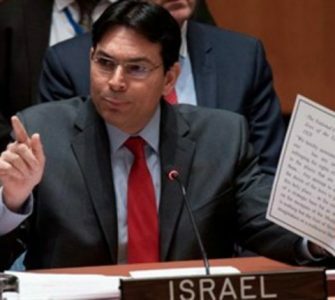 In the recent wave of Palestinian terrorism, dubbed the “stabbing intifada,” at least 36 violent attacks against Israelis have been carried out by Palestinian children, ages 11 to 17, usually using knives. 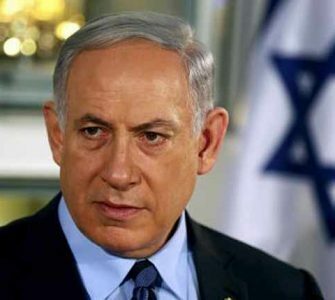 Five Israeli civilians have been killed and many other victims wounded.